Kenny Wayne Shepherd Band has today announced an East Coast tour of Australia in October 2018, his first visit in more than six years. Blues fans are in for a rare treat with Ash Grunwald supporting this legendary guitarist/singer/songwriter. 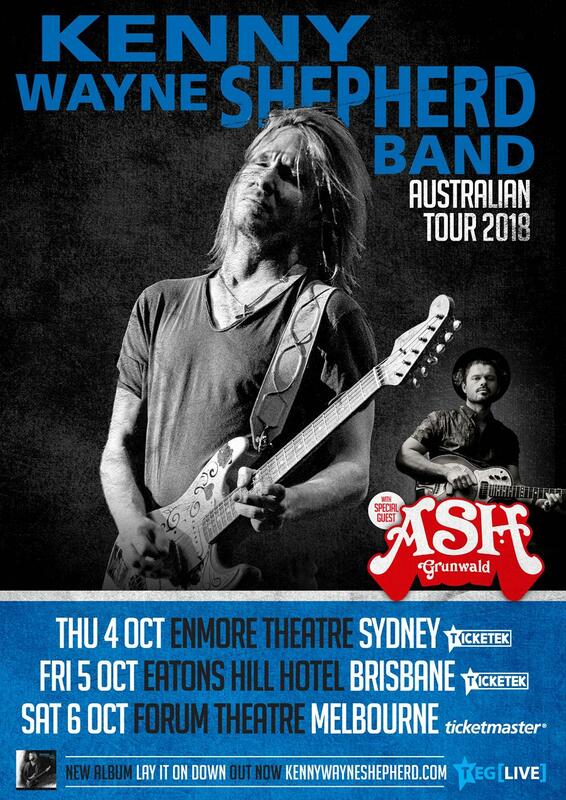 The tour commences at Sydney’s Enmore Theatre on October 4, travels to Brisbane on October 5 at Eatons Hill Hotel, and concludes in Melbourne at the Forum on October 6, showcasing Kenny’s array of rock and blues hits from an impressive career that spans over 20 years. Tickets for the Kenny Wayne Shepherd Band’s East Coast Tour are on sale Wednesday, May 23rd at Midday. For ticketing information, head to www.teglive.com.au, www.ticketek.com.au or www.ticketmaster.com.au. 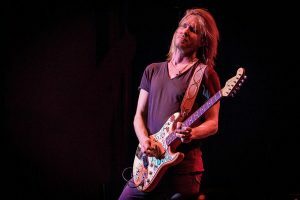 2017 was a huge year for Kenny Wayne Shepherd, his latest studio album Lay It On Down dropping in August. The album featured all new material written by Kenny and several of his musician friends. Debuting at #1 on the Billboard Blues Chart, #1 on the Rock Chart, #1 on the Internet Chart and #5 on the Billboard Top 200 (US all-genre album chart). Recorded at his home studio in Shreveport and co-produced by Marshall Altman, Lay It On Down also spent eight weeks at the top of the Blues chart. The Louisiana born axeman and songsmith has sold millions of albums, shining a light on the rich blues of the past and forging ahead with his own modern twist on a classic sound he has embodied since his teens. At 16 years old, he signed his first record deal and burst onto the scene with the release of his 1995 debut album Ledbetter Heights. His relentless touring and success on US rock radio helped to drive the album to Platinum sales status in the USA. His 1998 sophomore effort Trouble Is… also went Platinum in the US followed by 1999’s Live On. 2004’s The Place You’re In was a blistering rock record and was followed up by 2007’s ambitious 10 Days Out: Blues from the Backroads; A certified Platinum selling dvd documentary and soundtrack for which Shepherd received two Grammy nominations, a Blues Music Award, The Keeping The Blues Alive Award and was the #1 selling Blues album of the year. The film followed Shepherd and his band while they travelled throughout the American South and Midwest to record with such vintage blues greats as B.B. King, Clarence “Gatemouth” Brown, Hubert Sumlin, Pinetop Perkins and David “Honeyboy” Edwards on their home turf. 2010 saw the release of Shepherd’s long-awaited first live album, Live! In Chicago,recorded at Chicago’s House of Blues during the all-star Legends Tour, which was in support of the 10 Days Out release. Shepherd received another Grammy nod for Live! In Chicago which featured special guests such as blues legends,Hubert Sumlin, Willie “Big Eyes” Smith, Pinetop Perkins and Bryan Lee. The live disc debuted at #1 on Billboard’s Blues chart, as did 2011’s How I Go. 2014 delivered the release Goin’ Home, Shepherd’s seventh #1 debut on the Billboard Blues charts. Kenny Wayne Shepherd is thrilled to welcome Ash Grunwald as special guest on this tour. For 12 incredible years Ash has sustained a level of success in the Australian music scene that is the true testament to the well of his talent; nominated for six ARIA awards and three APRA awards, winning two of the latter. Global tours, remarkable collaborations with musicians both old and new, a fanbase that is not defined by age along with critical acclaim as the bastion of traditional blues whilst being at the forefront of innovation.